You are here: Home / Diary / Photo Hunt: Awesome! What could be more awesome than me! I don’t think Photo Hunt themes get any easier than this! We absolutely agree! You’re the best! hee hee! we think you’re mighty awesome, Sparkle! Sparkle, yous is pawsome and the picture, it is awesome too! That is just way to easy for you! We’ve tried, but we can’t think of anything. ….ahh….you had me at those captivating emerald eyes of yours!! Allie: well of course! You’re a cat! Cat= awesome! Pawsolutely Awesome! But how much Nip did you have to send them to use “sparkle”? We’re with ya 100%! Awesome indeed. No matter what pose you do, you sure are awesome. you certainly are pretty darned awesome!! 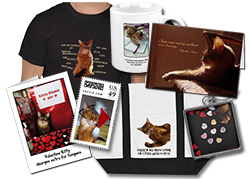 Sparkle, both you and your human are awesome for all you do to help kitties! Thank you both so much! Purrfectly Pawsome!!! We’re glad to see you have control of the remote! Happy Easter!!! You are adorable, love your portraits! Don’t worry Sparkle we’re sure you are the prettiest of them all. You are right Sparkle…. some things are just too easy!!! Awesome indeed! Sparkle, you ARE awesome, especially that tail! You do look awesome in that picture Sparkle. Have a great week end. A very pawsome photo of you Miss Sparkle….! Nobody ! Ask the mirror !